Head Chef ,Alps ,France ! Manage the kitchen to ensure that all meals are served on time and to the required standards. Maintain the highest standards of cleanliness in all kitchen areas by following established procedures each day. Conduct training for all staff in the areas of food handling, presentations as well as health and safety in the kitchen. Ensure the cost effectiveness of the kitchen by always being conscious of budgets. This role requires a high degree of organisation and involves being part of the management team. 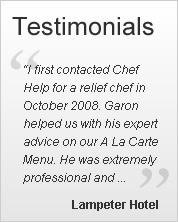 – Be well presented at all times wearing clean chefs whites and an apron. High standards of personal hygiene are essential.